Pioneers in the industry, we offer labeling machines from India. Our company is the major company known for providing Labeling Machines to our customers at wide range. These machines are used by our customers widely and highly appreciated for their features. These machines are very heavy in weight and are easy to transport from one place to another. 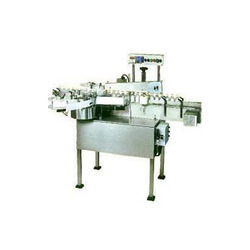 These machines works very smoothly without any defects for trouble free operation. These labeling machines can be accessed by our clients at cost effective prices. Looking for Labeling Machines ?